Shifts to magmatic, Alert level at highest, lahars, 100 000 evacuating! Around 100 000 residents living near erupting Agung volcano in Bali, Indonesia have been told to evacuate, officials said Monday, November 27, 2017. Late Saturday, November 25, hours the after the second phreatic eruption within a week started, Agung shifted into magmatic phase. Lahars were observed descending down the mountain on Sunday, prompting authorities to raise the alert level back to 4 (highest) at 22:00 UTC. Residents and tourists are warned to stay away from the volcano. The Aviation Color Code is at Red, continuous volcanic ash emission is rising up to 9.1 km (30 000 feet). There are currently no airplanes coming in or out of Bali. 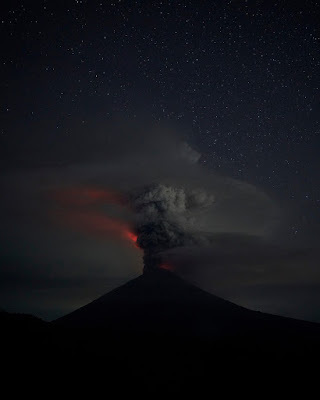 With a thick dark gas and ash rising more than 3 400 m (11 150 feet) above the crater, the eruption at Mount Agung continues to increase, Sutopo Purwo Nugroho, spokesperson for the National Board for Disaster Management (BNPB), said early Monday. Continuous ash emission is sometimes accompanied by explosive eruptions, with sounds heard up to 12 km (7.4 miles) from the summit. "There is a potential for a larger eruption," Nugroho said, adding that communities around the volcano and climbers/visitors/tourists are warned not to climb the mountain and respect the danger zone which is now expanded to all areas within a radius of 8 km (5 miles) from the crater and as far as 10 km (6.2 miles) to the north-northeast and southeast-south-southwest. This means some 100 000 people must evacuate. "We ask people in danger zone to evacuate immediately because there is potential for a larger eruption," Nugroho said. "So far, some 40 000 have been evacuated but a further 60 000 also need to move," he said. "There are those who haven’t evacuated because their farm animals haven’t been evacuated yet and those who feel they are safe because their area hasn't been affected during 1963/64 eruption," Sutopo said, adding that security personnel was trying to persuade people to leave but they could be evacuated by force. Bali governor Made Mangku Pastika later said that 150 000 could be called on to evacuate. BNBP released the following videos of lahars, also known as 'cold lava,' descending down the volcano, warning they may increase due to heavy rain and asking everybody to stay away from them and avoid activities near rivers.